Time 2:00 p.m. - 6:00 p.m.
-- "NEAR LAN KWAI FONG"
Refreshment Non-Alcoholic Drinks is served. Have you ever thought of making your own business cardholder? We believe everyone has talent to design their own tailor-made product. 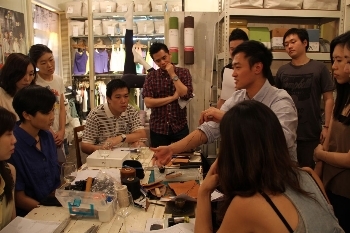 In this workshop, our leather worker designer will guide through participants to DIY their own leather cardholder step-by-step. Fine leather and leather crafting tools will be provided for every participant. Personal touch, e.g. name initials, can be added to make your leather cardholders even more special. HKUAA Green and Culture Group invites you to have a creative, entertaining and pleasurable leather cardholder making experience with your friends at HKUAA Clubhouse. Participants are encouraged to dress causally and be attentive to potential danger in the use of tools such as cutters, hammers and scissors. The Group will not be liable for damages arising out of or in connection with this event. Children under 12 are not encouraged to attend the event. If you have respiratory illness and/or allergies to leather, please consult doctors before the event. 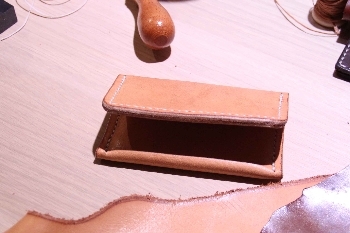 Leather making is intended to be a Do-It-Yourself activity. If you reproduce any products, you certify that you have the copyright rights necessary for such reproduction. The Group assumes no liability in copyright disputes. For safety reasons, participants should follow the instructions of HKUAA. Participants will be assumed to withdraw from the event of one's own accord for any activity, which violates the instructions or could affect other participants. *The above pictures are all retrieved from Dreamer Concepts.